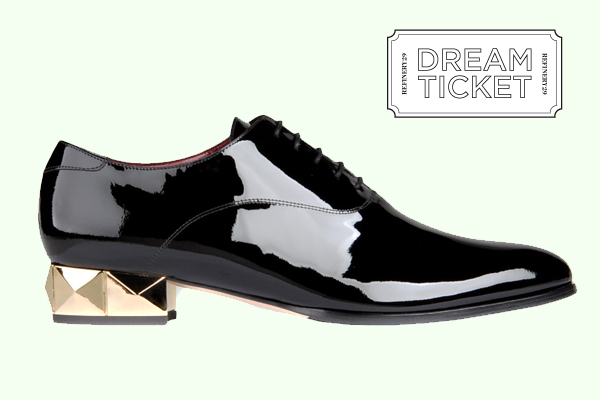 These Valentino gold heeled Oxfords; from his F/W 2012 collection. I discovered them yesterday, and immediately fell in Love. I’m normally a 4″ heel girl, but I think my tastes are changing and I’m becoming a bit more diverse when it comes to my shoes. The high shine, on these are stunning, but what gets me more is the gold heel. Wow! How would I wear: a tuxedo jacket with a low-cut close-fitting blouse (or with nothing underneath, but some strategically placed body tape), with either a pair of tuxedo shorts, a long black evening skirt (with a back split), or pair the tuxedo jacket with some really skinny black ankle length cigarette pants (a la Audrey Hepburn), Prada baroque sunglasses, red lipstick, and a little gold beaded clutch! In my opinion, Tres Chic and very European! Another idea, how about a crisp white tailored shirt, tucked into a black full length ball gown skirt with in-seam side pockets and a wide patent leather belt (remember you can thrift all of this!). At $745 these shoes would take some saving up, but a girl can dream can’t she? If you’re so inclined click here to buy. If you think they’re too masculine, always remember ladies, a confident Diva can make anything look feminine! 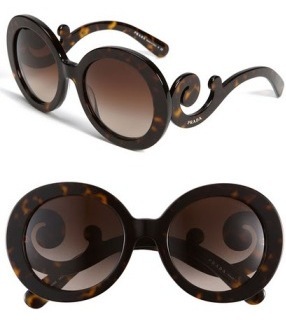 I love my Prada Baroque Sunglasses ~ Best purchase ever!